If you enjoy divination, you’ll know that you can buy many different types of rune sets these days, ranging from the most simple to elaborately painted and decorated or carved runes, with beautiful bags and boxes to keep them in. However, if you’re drawn to runes, you should consider crafting your own set. It’s not difficult, and your own set of runes will always give you a much clearer reading than a purchased set, because you will have infused them with your own energy and intention while making them. To make your own set of runes, you must first decide on the material of your choice. Traditionally, runes should be made from entirely natural materials. Wood is a very popular choice. You could choose wood from a favorite tree, or from a tree you feel drawn to. Fallen logs can be taken, but the best wood comes from the living tree itself. Ask permission from the tree before cutting, and leave a small offering of water when you leave. You only need a piece a couple of inches thick and about 2ft long. Stones or pebbles are another popular choice. You can get these from a beach or a river near you. Ideally, you need to select pebbles or stones which are a fairly uniform shape and size, with a flattish surface. You could choose ones of the same color, or just pick up those you are drawn to. While you’re at the beach, shells can also be used to make runes, albeit fragile ones, so look around to see if you can collect 24 shells of a similar size and shape. Some rune makers like to use bone to create rune sets. This is very much a matter of personal preference, but if you do use bone, you should only use bone from an animal whose manner of death you know about, and preferably, one which died of natural causes. Having chosen your materials, the next step is to actually inscribe the runes. If you have chosen wood, you’ll need to allow the wood to dry out before you can start this step. Then cut your wood to shape, into ovals or circles, or small flat strips if you prefer. 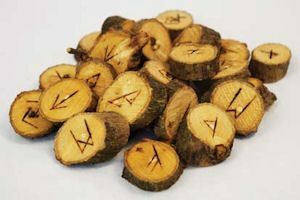 To inscribe runes onto wood, you can cut into the wood, and then stain the wood. Traditionally, you should use your own blood to stain the cut, but you can also use any kind of natural staining option such as natural pigments. Alternatively, you can use a pyrography tool to burn the rune’s image into the wood, which will then not need staining. Or you could simply paint the rune onto the wood. If you’re using shells, stones or pebbles, you will probably need to paint the runes, although some very soft stone may allow you to use a dremel tool to inscribe the rune shapes. If you do paint, cover the stone, pebble or shell with a layer of shellac once it is dry, in order to preserve the paint. Most people, especially beginners, will use the 24 runes of the Elder Futhark, but there’s no reason why you could not invent and use your own symbols if you prefer. Having completed the set of runes, the next step is to consecrate them. To do this, light a candle and focus your mind. Handle each rune in turn and say its name aloud, meditating for just a moment or two on its meaning. You might like to say a short prayer asking for your runes to provide you with insight and guidance. Having consecrated your runes, it’s helpful if you can sleep with them under your pillow for a couple of nights, or at least carry them with you for a few days, to help them absorb your energy. And then – the exciting bit! – you’re ready to start casting your very own runes!